Dovetailing Tip: Use the extra Basil Pesto from meal 3. Preheat the oven to 450°F. In a large bowl toss the grape tomatoes, chopped zucchinis, sliced shallot, thyme, and olive oil together. Season generously with salt and freshly cracked black pepper, and toss to coat. Spread the veggie mixture onto a baking tray and roast for 15 to 20 minutes, or until the tomatoes burst and the shallots crisp up. Cook the polenta with the water and salt according to the package instructions, or follow these simple steps. Add the fresh corn kernels 10 minutes before the polenta is ready. Blend all of the pesto ingredients together until smooth in a blender or food processor, or with an immersion blender. Stir the grated cheese and butter into the polenta just before serving. Taste and adjust the seasoning if needed. 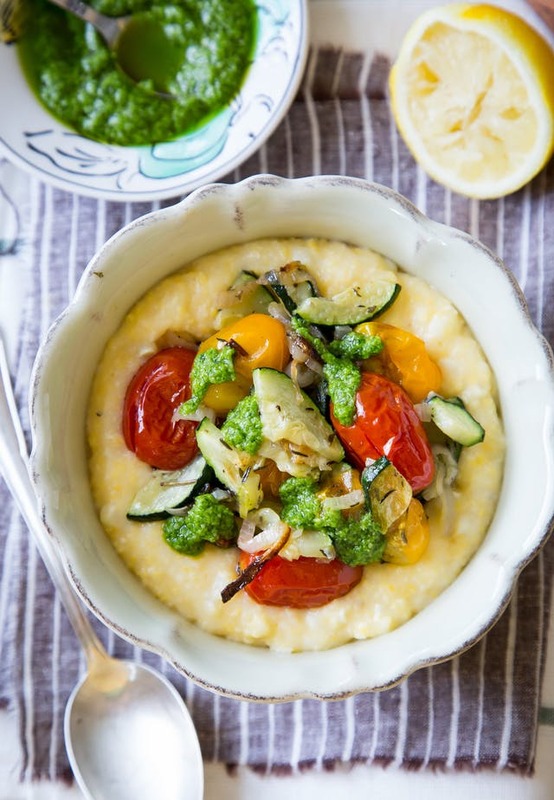 Evenly divide the polenta between 4 bowls; top each bowl with roasted veggies and the prepared pesto. Serve immediately.